Mix the flour, salt, sugar and yeast in a bowl, puree the coriander with the oil and water, pour into the bowl, mix, knead to form a smooth dough. Cover and leave to rise at room temperature for approx. 1½ hrs. until doubled in size. Flatten the dough a little, roll out (approx. 30 cm in diameter) on a lightly floured surface, place on a sheet of baking paper. Puree the coriander with the sour single cream, spread over the dough base, leaving a border of approx. 2 cm all the way around. Top with the asparagus and spring onions. Heat the tray in an oven preheated to 240°C. Remove from the oven, slide the flatbread onto the tray, bake for approx. 25 mins. on the bottom shelf of the oven. Heat the oil in a frying pan. Season the rib eye steak, fry for approx. 2 mins. on each side, remove, leave to rest for approx. 5 mins., carve into slices. 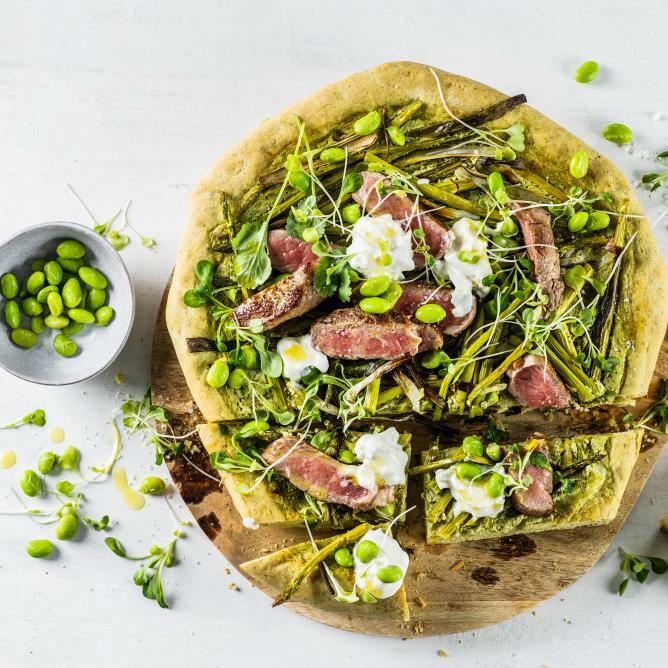 Mix the edamame beans, micro greens and coriander, season with salt, spread on top of the flatbread along with the meat. Top with the burrata. Whisk together the oil and lemon juice, season with salt, drizzle over the top. Instead of asparagus, use 1 sliced courgette.